This is a winner, a Kentucky Derby Winner Recipe for sure! 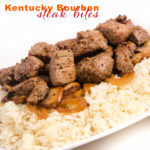 Kentucky Bourbon Steak Bites are packed full of rich flavor, delicious and tasty too. Steak Bites are quick and easy to prepare as they take only minutes to cook. A little bit of marinating time helps the flavor really dig deep into a beautiful strip steak that you will be talking about for awhile. Give it a try, this recipe was devoured! 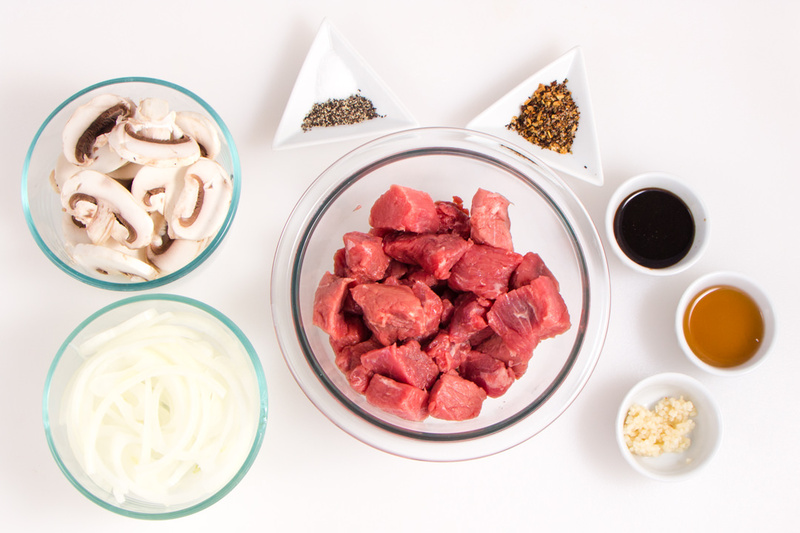 It only takes a minute to cube up the steak and place it into a z-lock bag with some of your favorite bourbon (or Beef Broth if you prefer), along with some course steak seasonings and Worcestershire sauce. Then allow this to marinate for 1-2 hours. It’s as easy as that. Meanwhile you can wash and slice some mushrooms and thinly slice some sweet onions. I love mushrooms and onions, in fact I would eat them cooked up for dinner if I could. Yummy! Over a medium/high heat in a fry pan or a cast iron pan, allow the pan to get hot and then add some olive oil. Allow that oil to get heated up as well, but don’t burn it. Then place the steak bites in the hot pan. Hear the sizzle? Oh yum! Allow them to cook for 1 minute and then with tongs turn them over and cook 1 minute more. Cooking time will vary depending on desired pan temperature and how you prefer your meat. This will give a good medium cook to the bites. Cook more or less, however you prefer. When your steak bites are done, remove them from the pan but leave all those yummy seasonings and juices behind. Add butter to your hot frying pan and add your mushrooms and onions. Those rich Kentucky Bourbon flavors will infuse right into your mushrooms and onions. It’s wonderful. You can always substitute Beef Broth for the bourbon if you prefer. You will still have a lovely flavor in both your steak and veggies. Saute’ these mushrooms and onions up until desired doneness and then you can plate your meal. The veggies give a nice bed for the steak bites. You can also serve this with our Savory Rice. This recipe compliments it will. I have served Kentucky Steak Bites as both a main course as well as an appetizer. 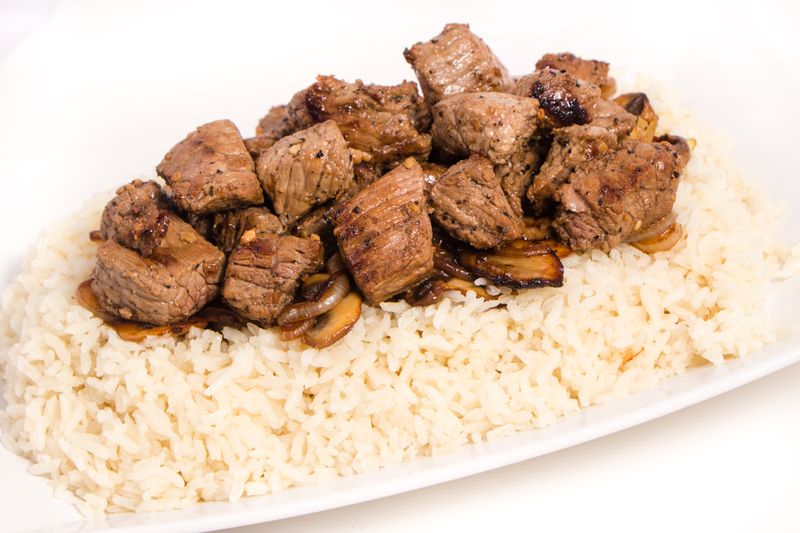 When serving a crowd potluck style I plate on a large plate on a bed of rice with mushrooms and onions making a nice rim around the steak bites in the center of the plate. It’s easy for my guests to dish up and get all the flavors. As an appetizer you can serve with picks too. Anyway you server Kentucky Bourbon Steak Bites will become a new family favorite as they are so full of delicious flavor. 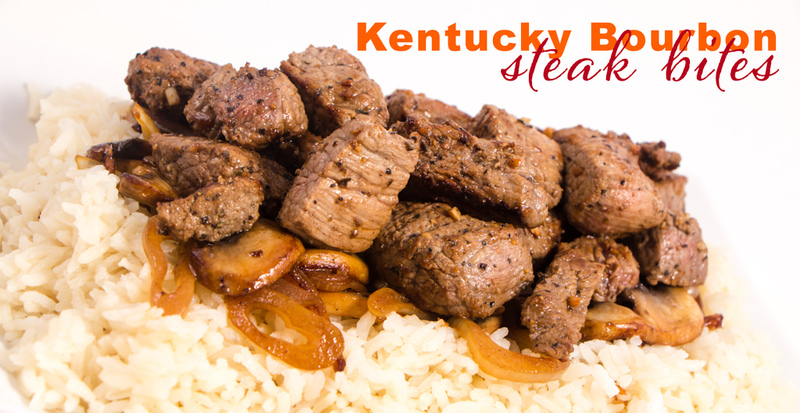 Kentucky Bourbon Steak Bites are packed full of flavor, so tender and delicious. These Steak Bites can be served as a main course or appetizer. Easy to follow recipe that everyone will enjoy. 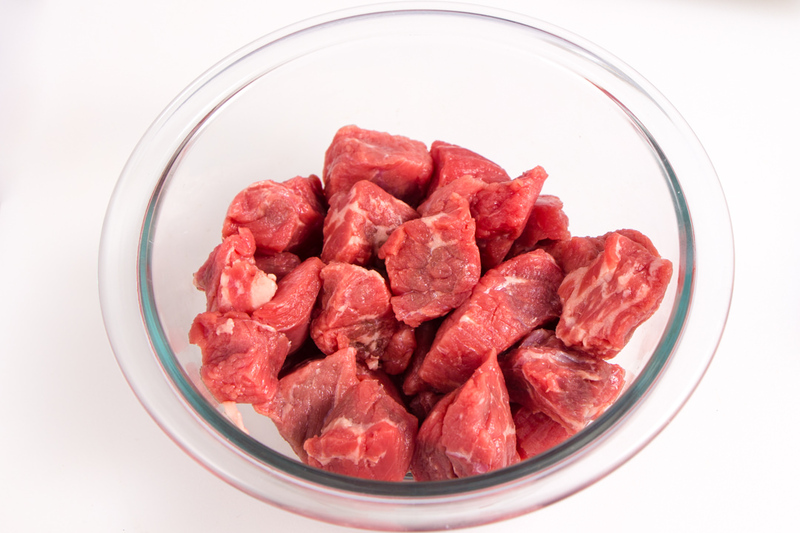 Cut steak into 1 inch cubes and place in a bowl. Add Bourbon, Steak Seasonings, Garlic, and Worcestershire Sauce to bowl. Stir to mix. Cover bowl and allow to marinate for 1-2 hours. Over medium/high heat, heat a frying pan or cast iron pan. Allow pan to get hot. Add Olive Oil and add Steak Bites. You should hear a sizzle. Cook steak bites for 1 minute and then with tongs turn over. Cook for an additional 1 minute and then remove from pan. Add Butter to hot frying pan. Add mushrooms and onions and allow to saute' to desired doneness. 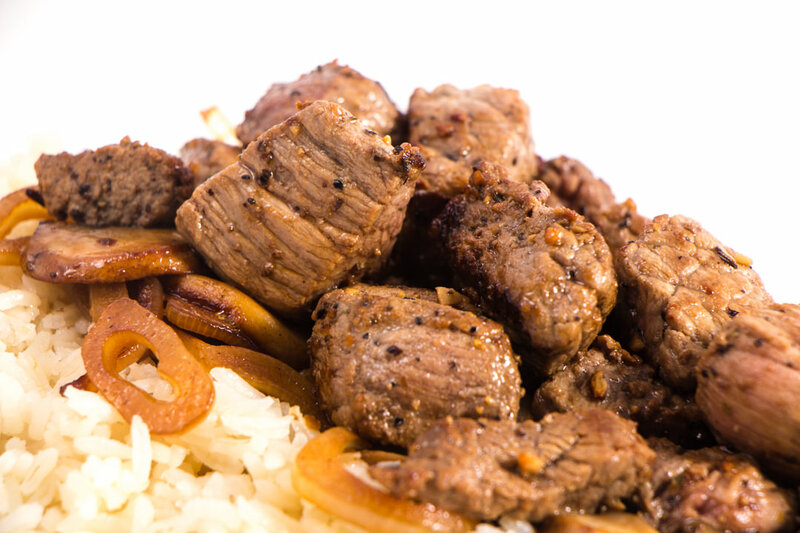 Serve over rice and enjoy and of course, Salt and Pepper to Taste! This looks delicious. What are “course steak seasonings”? I clicked on the link but it just leads me to a picture of the steak bites. Hi Shari…GREAT Question… I use a coarse seasoning mixture from McCormick. I like the Chicago mixture, or the Montreal mixture. It has coarse cracked pepper, and other herbs and spices. Sometimes I also like to use the Garlic and Herb Veggie seasonings from McCormick as well. They all work wonderfully with this recipe! Great, thank you so much for the fast response. I can’t wait to try this! Sure thing! Hope you enjoy the recipe as much as we do! YUMMMMM! I gotta try this. Also, your video is bangarang! How do you film those angles without it being shaky? Do you have a tripod? Thanks for sharing this great article and recipe! Hi Emily! Thank you for your comments. I’m working on post showing more of my behind the scenes and my camera and video set up. Honestly, it’s bare bones basic! It’s a selfie stick bracketed to overhead cabinets. 😉 Watch for my post with full discloser. Definitely going to try this! It seems like the perfect weeknight dinner! Love your site by the way too! Oh. My. Gosh. This is so simple and looks delicious. I can’t wait to try it! My mouth is watering looking at the pics. I needed a special dinner for tomorrow night. I believe I have found it! That is easy to make, I usually do slow cooker for beef cube, I have to try it, pinned it. This look’s delicious.I am definitely going to try this recipe. My husband’s favorite cheese, Sartori Kentucky Bourbon Bellavitano, would add a wonderful touch. This look delicious! I think I’m going to add this to my meal planning for next week! ? This looks like a fun, easy meal! I would totally try it! Besides the amazing flavor, it’s a fun easy meal! Love it! I am going to add this to my dinner list, I always need new recipes and this hits the spot! This is so timely! I was actually just thinking the other day that I was in need of something new to do with steak. I was getting tired of the same-ol-same-ol. This looks really yummy! It’s great to mix things up. This is a perfect recipe to change things up with a steak. I hope you love it! You definitely nailed this! These look amazing! Thanks! It’s a wonderful recipe! You had me at bourbon! Haha…a touch of bourbon does add some beautiful flavor. These look delicious and simple! I love anything with Worcestershire Sauce! Worcestershire always gives a great flavor to recipes. I love it too.